Earlier today, Christies Auction house auctioned a very rare stainless steel Cushion-shaped Small Egiziano, which was made in 1954 for the Egyptian Navy. This Rolex made vintage Panerai is unusual because it has a bleach blonde dial. 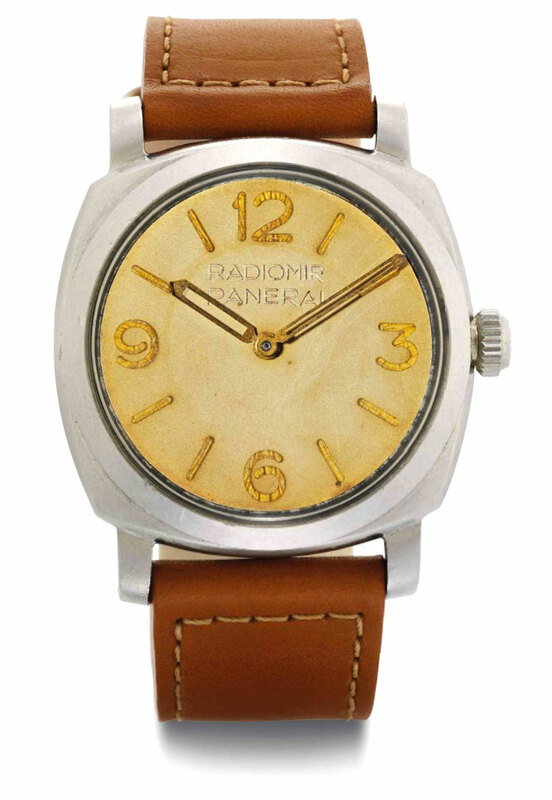 Ironically this dial was once white, but the Radium on the markers literally bleached the dial to a blonde color over the last 57 years, which makes this watch a highly sought after watch. The Small Egiziano is arguably the most beautiful vintage Panerai model ever made, based upon its amazing simplicity, and hopefully the modern Panerai company will have the wisdom to bring this beauty back to life, just like they did with the Reference PAM00372. I think Panerai should offer it with an antiqued cream dial like this one, as well an antique brown one, modeled after Hammer's stunning 6154 example, as well as a standard antiqued black dial version with a dial like the PAM 00372. It finally happened!!! 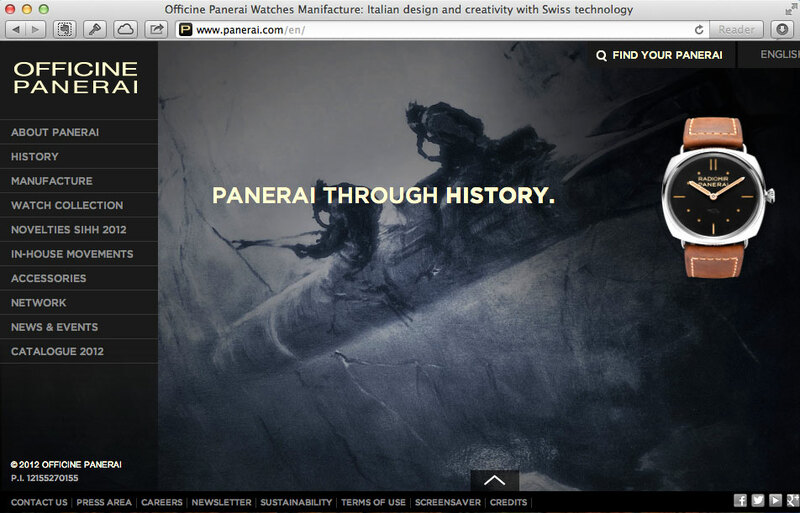 Today, Panerai launched its all-new Panerai.com website and it looks great!!! Giovanni Panerai opens his watchmaker's shop on Ponte delle Grazie in Florence: both shop and workshop, and also the city's first watchmaking school, Officine Panerai's history begins here. 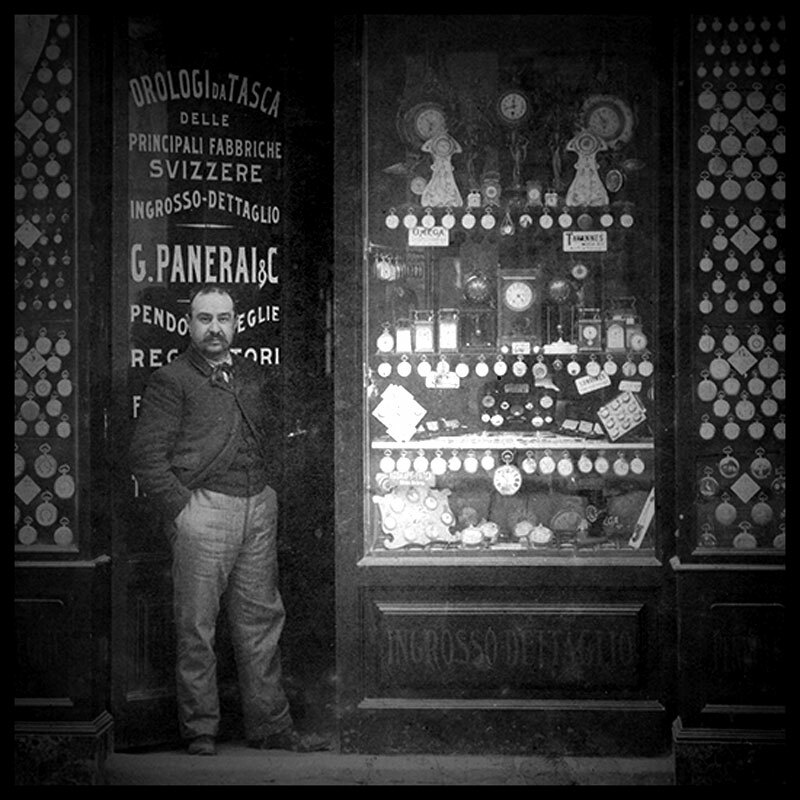 The shop later moves to its current location in the Palazzo Arcivescovile in Piazza San Giovanni, changing its name to "Orologeria Svizzera" at the beginning of the twentieth century. The old Panerai.com was long overdue for a major overhaul, and the all-new website does not disappoint, and it is now full of many high-resolution images so you can actually see the all the beautiful detail in the watches. 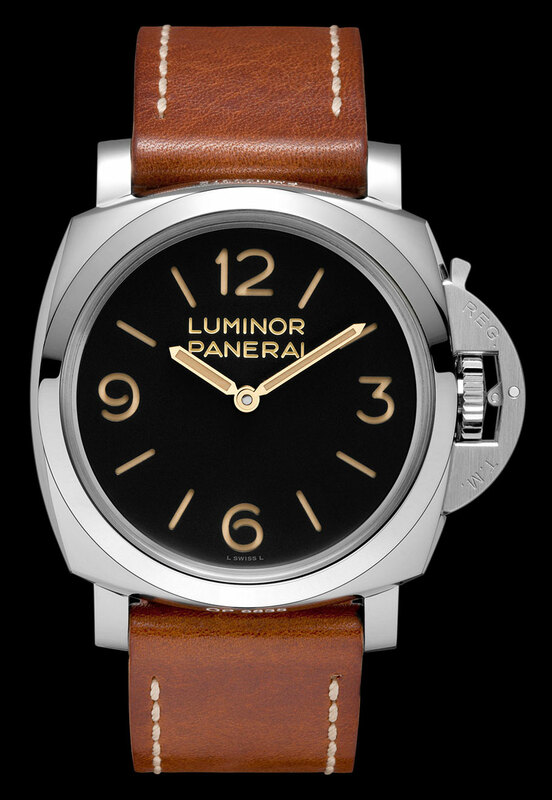 The following images are from the new Panerai.com and this first one is of the Historic Luminor Panerai 1950 3 Days / PAM00372 which is 47MM. I think it is safe to say that the all new Panerai.com now lives up to the beauty of their watches, and showcases them they way they deserve to bee seen. Note: I am currently working on this story, and there is much more to come. When this story is complete I will remove this notice. I have to let you know up front, that this story is a preview. Why? Because this is a story I have wanted to tell for a long time, but it is so detailed, it is going to take me some time to put it together. This watch changed a man from Australia's life, and his name is Hammer. In the future I plan to share more of his amazing story. In the meantime let's take a look at this absolutely stunning beauty. So what makes this watch so crazy, over-the-top beautiful? Obviously, the unbelievable patina on the dial and hands, coupled with the amazingly timeless lines of the Panerai 6154–not to mention the classic Rolex Brevet winding crown. The side profile of the 6154 is without equal, with its streamline art-deco lines. In the future, I plan to write an article which details the difference between the case shape of the 6152 that lacks the half-crescent and the 6154, which at first glance look remarkable similar. In my option, the 6154 has a much better body geometry. In particular, the 6154 has the distinct horizontal line running through the middle of the case (as seen below) whereas the 6152 lacks the distinct line, an has more of a simple convex shape. Also, the 6152 has a much side profile because its crystal stands up much more vertically, where the 6154 crystal is much more domed and streamlined. 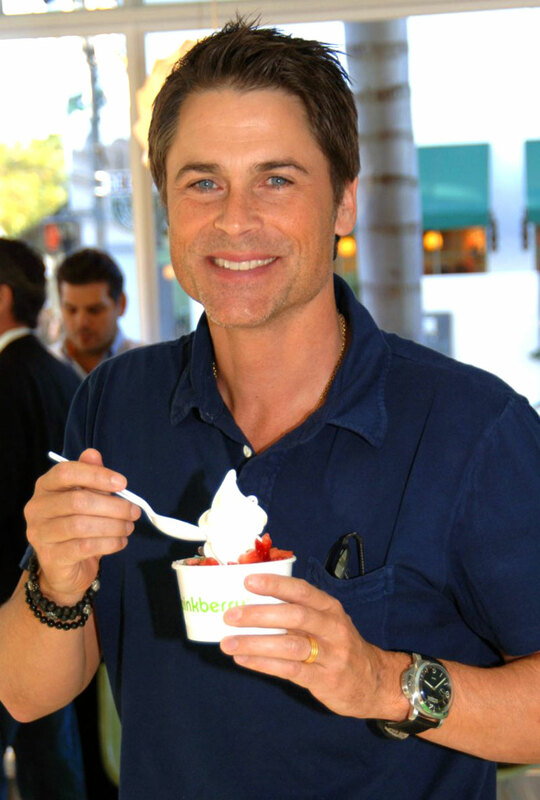 To the best of my knowledge, Hammer only owns and wears two vintage Panerai watches. He used to have a larger watch collection of ten watches, but he sold it to purchase his beloved 6154 with the brown dial. He also owns an original Reference 6152 with the black dial that has the Luminor Panerai designation. In the photo above and below, we see Hammer's brown dialed Radiomir Panerai 6154, next to his Luminor Panerai 6152, which has the now trademark half-crescent crown guard. I argue that Hammer is an extremely fortunate man because his two beautiful vintage Panerai watches–both made in the middle of the 1950s–represent the ultimate grail/pinnacle vintage Panerai collection. 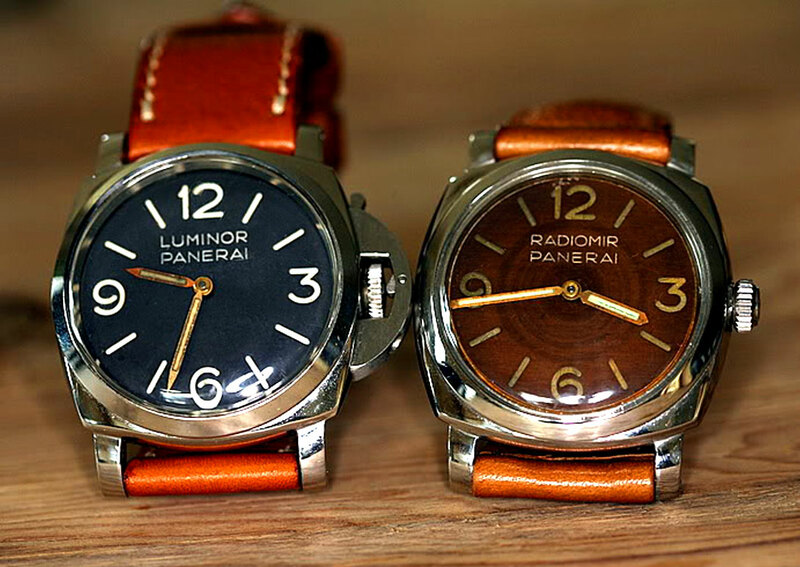 The photo below shows Hammer's Panerai 6154 between two other Radiomir Panerai models that show the full spectrum of dial color that exists in the world. Nobody was more responsible for the popularization of modern Panerai than movie star Sylvester Stallone. 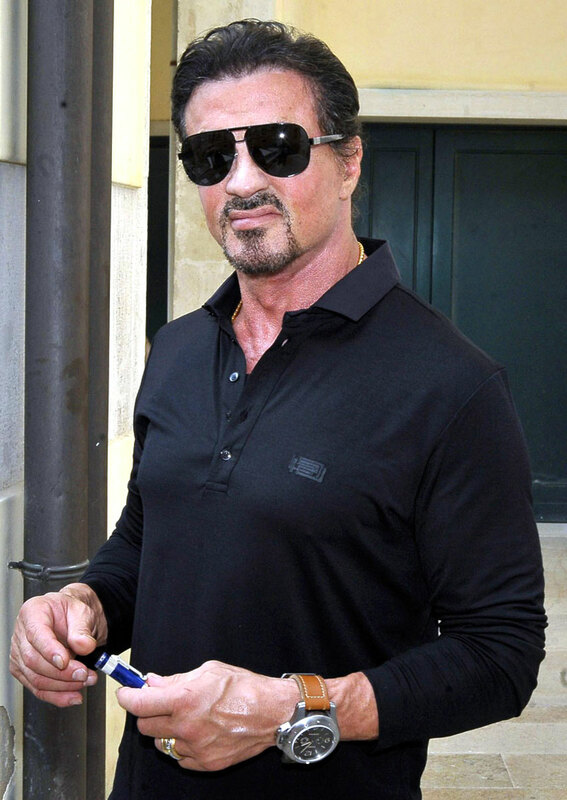 In the photos below Sylvester Stallone is pictured wearing his 60MM Radiomir Egiziano. In the future I will be going much more into detail on Sylvester Stallone and his love of Panerai. This monster is 60 MMM–and you thought 47 might be too big for you!?!? 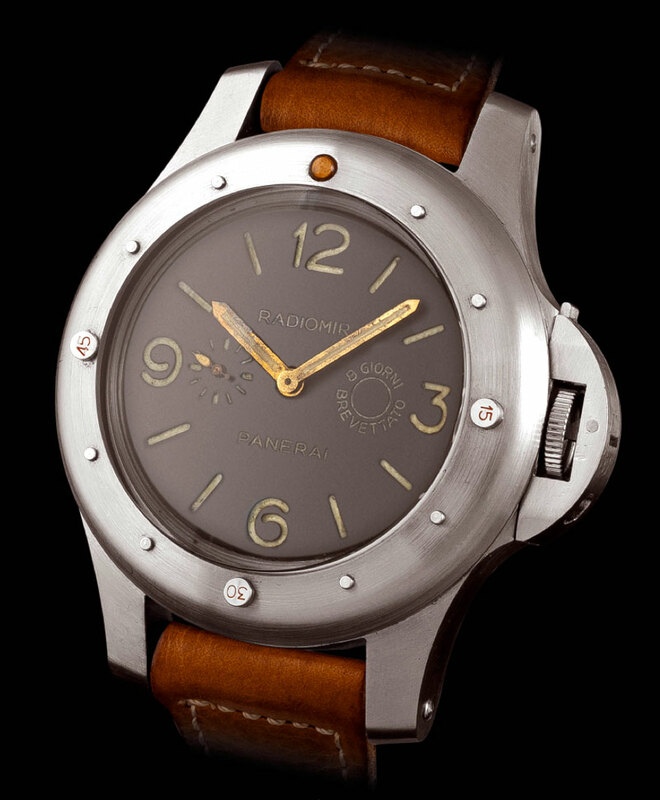 The PAM00341 has a hand-would mechanical, Panerai P.2002/7 calibre with an 8 day power reserve. 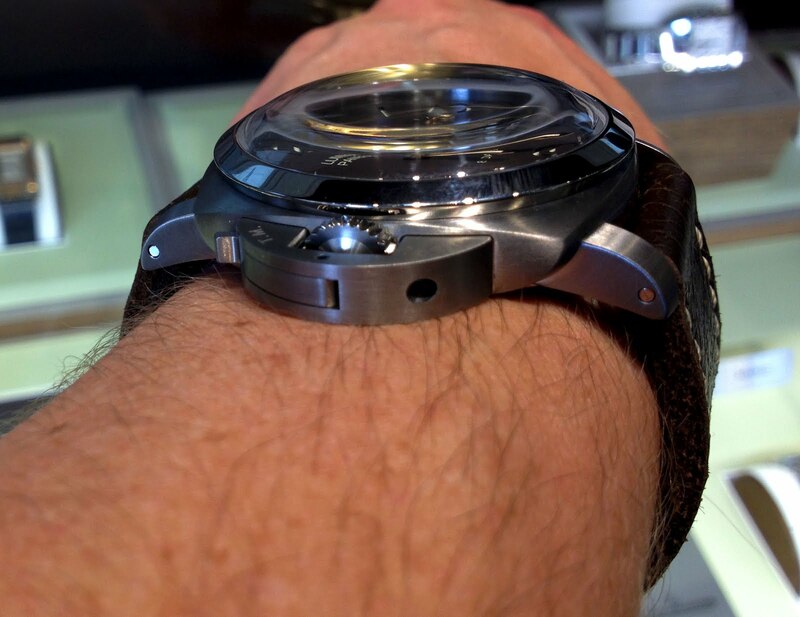 The entire body and rotating bezel is made from brushed titanium with a 26mm lug width. The Plexiglass crystal on this beast is 5.8MM thick!!! The PAM00341 (pictured above) pays homage to the 1956 Panerai Reference 2/56 (pictured below) which was made for the Egyptian Navy Commandos. 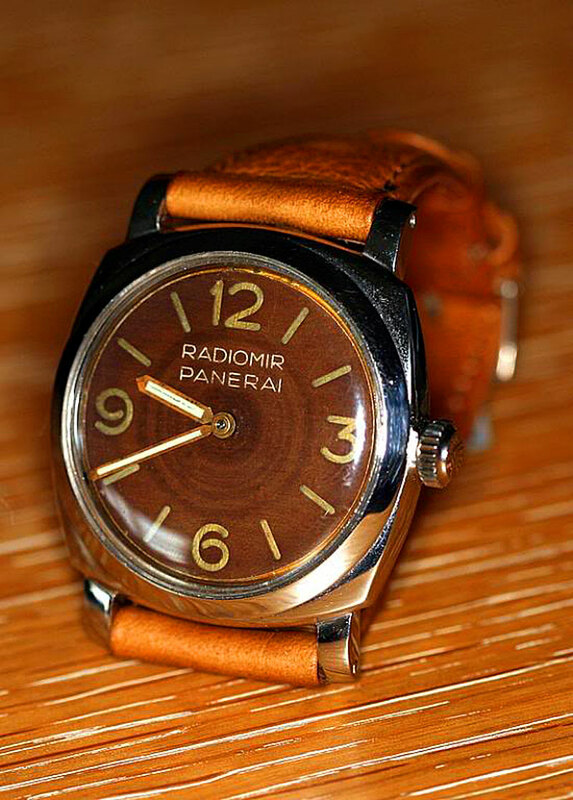 Panerai only made 50 of these watches, which are very rare. 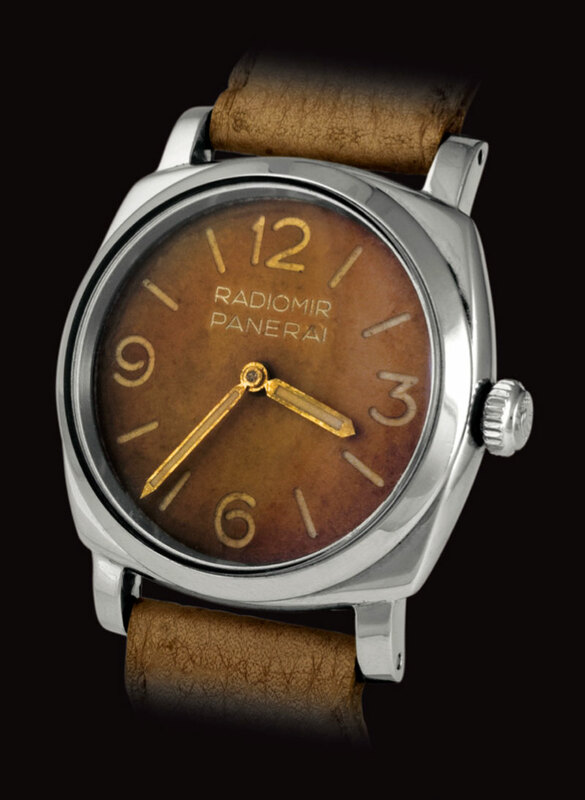 An original 1965 Panerai Radiomir Egiziano is pictured below. The new PAM00341 is extremely close in design. The only difference is that the original 1956 Panerai lacked fluted spinning bezel teeth. Also the GPF 2/56 had a 16" Angelus 8-day movement which had the subsidiary second hand subdial at 9 o'clock. 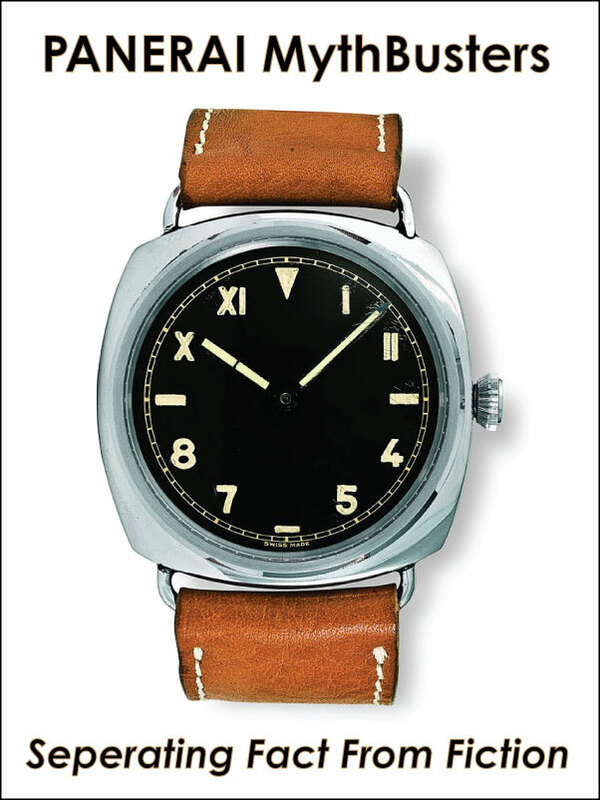 Ever wonder what the origin was of the trademark Panerai Half-Crescent Crown Guard? All the original Rolex made Panerai watches featured a waterproof Rolex Oyster winding crown up until 1954. The first watch pictured below is of a 47MM 1955 Radiomir Panerai [Reference 6152-1] which has a standard 8mm Rolex Oyster screw-down style winding crown. The way it worked, was that you had to grab the winding crown and turn it counter-clockwise until it released. Then you could pull it out to change the hour, or minute, or wind it. 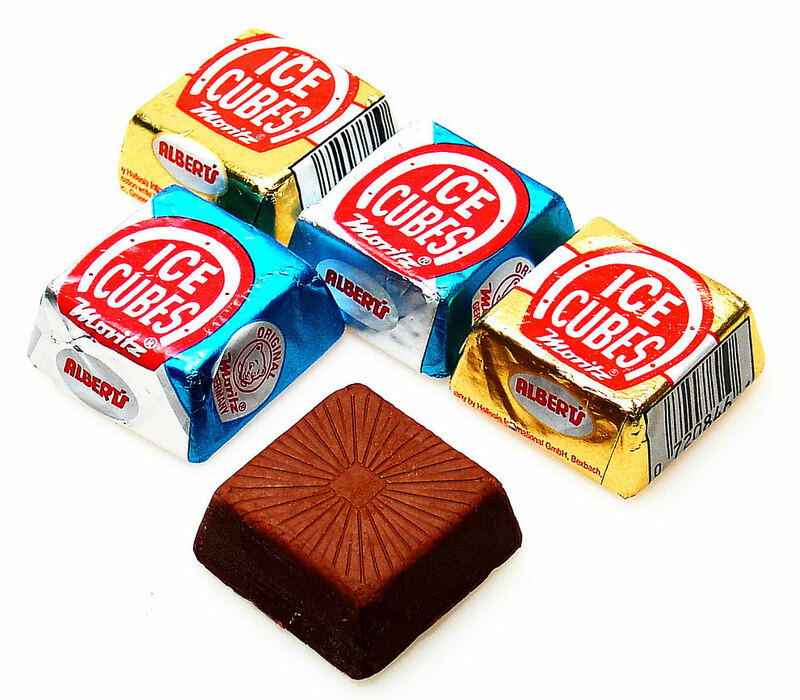 Then you would press it toward the case and screw it back down to lock it–kind of like a jar lid. This method created a challenge since in order for the watch to run properly, the user would have to unscrew the crown in order to wind the watch every day if they wanted to make certain it kept proper time. If the user did not do this properly with perfect finesse, it could result in the crown tube stripping and having to be replaced, not to mention it would have been a pain to unscrew, wind-up, then screw it back down. In 1955 Panerai came up with a new idea which they called the Tight Seal Device, which created a half-cresent crown guard that would protect the winding crown. You can see this mechanism on the 1955 Radiomir Panerai pictured below, which is a Reference 47mm 6152-1. 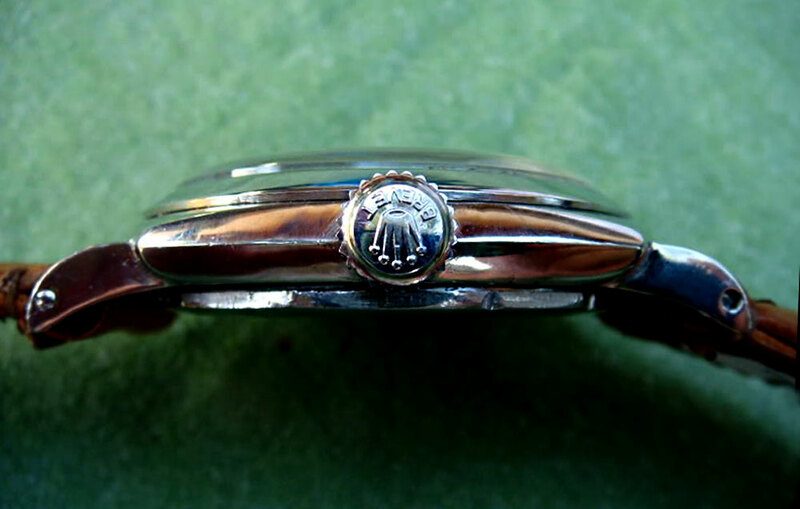 It is likely Panerai came up this the novel method of locking the crown in order to allow the user to avoid having to unscrew the winding crown daily. 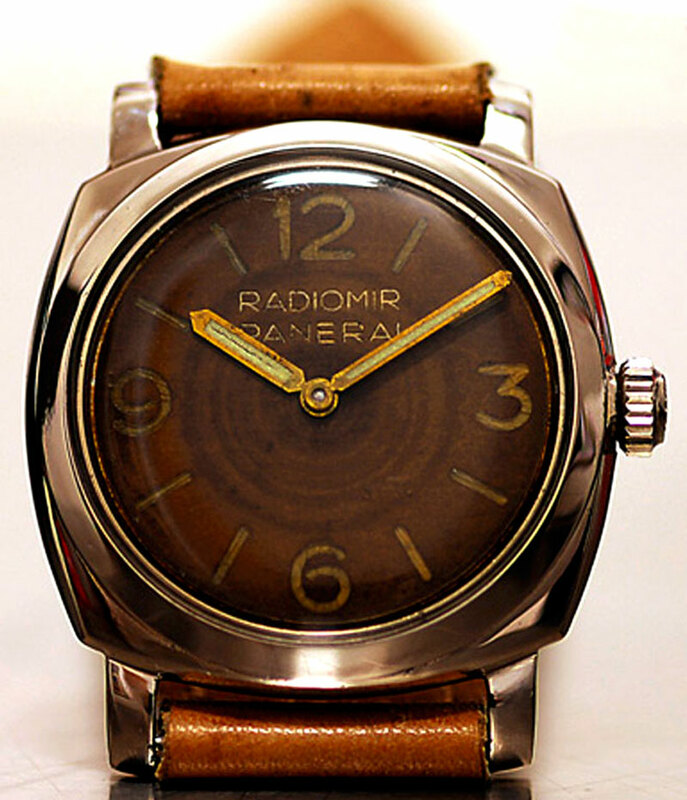 This watch is unusual, in the sense it is the very first Panerai with the now trademark half-crescent crown guard, but notice it has a Radiomir Panerai dial designation, and NOT a Luminor Panerai designation, which became standard on this model just after the first prototypes were made. Both of these images appear courtesy of my friend, John Goldberger. On of the great Panerai mysteries, is where did the half-crescent crown guard come from? Who designed it and why? Also, it is important to note that Rolex stopped making Panerai watches in or around 1955, so you have to wonder if this was due to the fact that Panerai filed for a Patent on this new method of waterproofing a watch winding crown? As previously mentioned, it could also have been an attempt to overcome the issue of the crown tubes potentially being able to be striped. Nobody knows today for certain, and an obvious question, is why didn't Panerai fit the watches with automatic movements? Pictured below it a copy of the original Panerai Tight Seal Device Patent application filed in the United States Patent Office on November 26th, 1956. Figure 1 illustrates how the half-crescent crown guard functions. The United States Patent Office application 2,954,665 was files by Maria Panerai and Guiseppe Panerai, both of 2 Piazza Galileo Ferraris, Florence, Italy, and it lists them both as the inventors of the Panerai Tight Seal. The application claims priority back to an application filed in Italy on November 30, 1955. The way U.S. Patent law worked at the time, was that if you filed a patent application in a foreign country, was that you had one year to file your U.S. patent, so we see that the U.S. application was filed 6 days before the 1 year deadline. 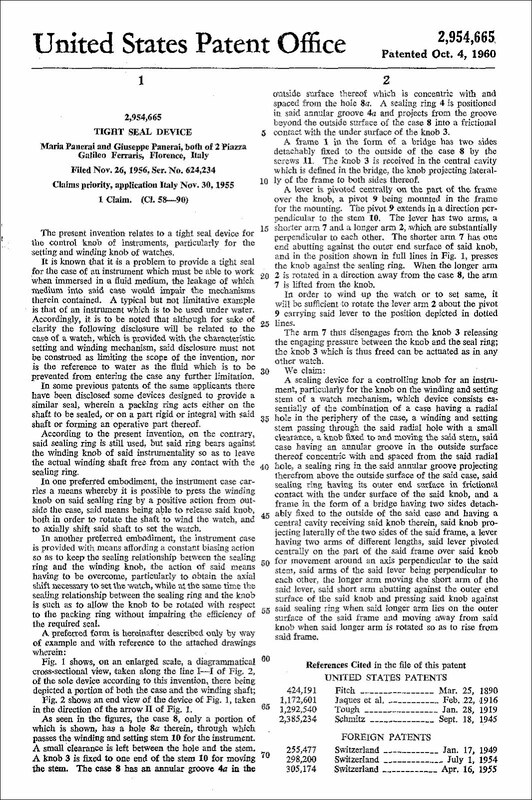 "The present invention relates to a tight seal device for the control knob of instruments, particularly for the setting and winding knob of watches. It is known that it is a problem to provide a tight seal for the case of an instrument which must be able to work when immersed in a fluid medium, the leakage of which medium into the said case would impair the mechanisms therein contained. A typical but not limitative example is that of an instrument which is to be used under water." So what does this patent application mean, and why was it filed? If I understand it correctly, Panerai is claiming that with their Tight Seal Device system, the watch can still be wound underwater, without effecting the waterproofness of the watch. 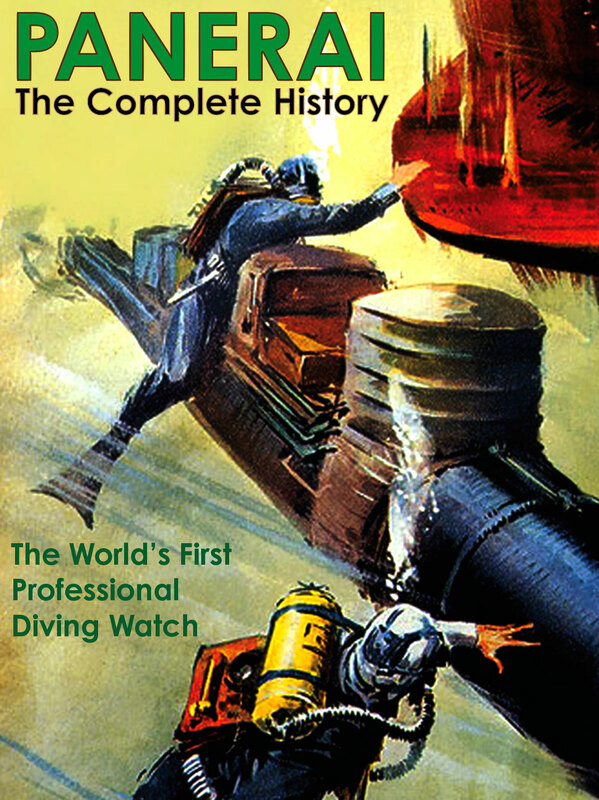 Another interesting historical note, is that all the Rolex made Panerai watches, which were made from 1936-1955, were essentially the first diving tool watches made. Rolex formally introduced the Rolex Submariner diving watch in 1954, which was the year Panerai filed the original application in Italy. It stands to reason that this is more than a coincidence. It is also interesting to note that despite the fact Panerai first filed the Tight Seal Device patent in Italy in 1955, it likely took at least a few years to test and develop. Perhaps in 1953 or 1954, Rolex told Paneari they would no longer continue making Panerai watches since they planned to come out with an aquatic Rolex model named the Submariner? This brings about the question of why Panerai created and filed this application, made some watches with the half-crescent crown guard for a year or two, and then stopped!?!? It is likely that once Rolex introduced the Submariner diving watch, which had the rotating bezel, it functionally obsoleted the Panerai watches. I also learned that many of the Italian Royal Navy divers wanted a Tudor or Rolex Submariner because they had the spinning bezels that could time dives. 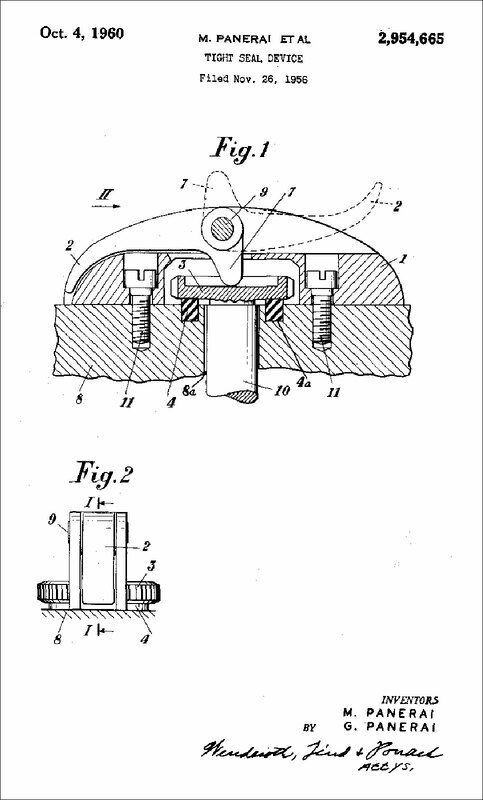 If you think about it, the Tight Seal Device is a deeply profound and mysterious gift from the mid 1950s. Why? Rolex essentially made all the vintage Panerai watches from 1936 to 1955. This is a fact. Nobody knows exactly how many watches were made over that 20 year period. Panerai CEO, Angelo Bonati mentioned in an interview in 2012 that he believed they only made 300 pieces in total, and if you do some basic math, the vast majority of those 300 watches had a standard winding crown, so at the very tail-end of that 20 years period, some of Panerai's last models incorporated the Tight Seal Device–maybe the made 20-30 with the half-crescent crown guard, then Panerai watch manufacturing disappeared into oblivion, and remained dormant until the brand was resurrected in 1993. The Supreme irony is that if you fast-forward to today, in 2013, the modern Officine Panerai watch company's primary trademark is the Tight Seal Device crown guard. As a matter of fact, early on when the modern Panerai company began, they brilliantly protected the Tight Seal Device crown guard as a Registered Trademark of the brand, and even engrave "REG. T.M." on many Tight Seal Crown Guard fascia. When most people think of Panerai watches today they think of a watch that looks like the stunningly timeless PAM00372 pictured below. The modern model (Introduced in 2012) 47MM PAM00372 is one of the most popular vintage Panerai models made today because its DNA is so similar to that of the original Reference 6152 made in the mid 1950s. The most interesting fact to me, is that the modern Panerai company is based upon a piece of mid 1950s design that was left behind in antiquity, only to be revived four decades later, and made into the cornerstone of the modern Panerai Brand. Talk about a magnificent gift from the Italian past!!! Panerai really is the ultimate example of the Phoenix crashing violently into the ground, then rising from the ashes to fly even higher and faster. To this day, the Tight Seal Device remains a mystery, and hopefully over time, with deeper research, I may be able to discover more of this magnificent history. It is also fascinating to note that in 1955, if you wore a Panerai 6152 or 6154, you would have looked out of place, because at 47MM they were considered to be an enormous oversized wrist-watch. But if you fast forward, once again to 2013, human beings have grown quite a bit on-average in height and weight, and the current PAM00372, which was based upon the original 6152 is perfectly germane today. The PAM00372 really is the ultimate example of a Back To The Future watch. In other words, when I wear a PAM00372, it seriously trips me out to think it was designed in the early 1950s, and looks amazing today. If you wore an original Panerai Reference 6152 from 1954, today, it would look very, very cool and apropos, far more so than a Rolex Submariner from the same year. The Rolex would still look cool, but a little on the small side, and definitely not as masculine. If you think about it, how many things that were designed and made in the 1930s through the mid 1950s could be made almost identically today, and still be magnificently useful and beautiful. Not many, but the vintage Panerai design flawlessly transcends obsolescence!!! 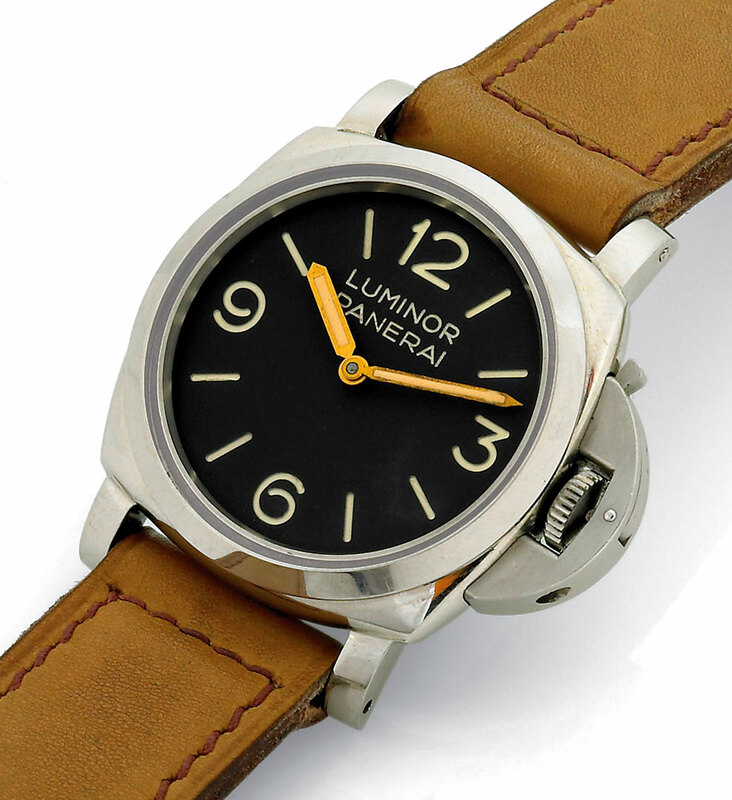 This stunning original Luminor Panerai [Reference 6152-1] was produced in the late 1950s for the Italian Royal Navy, and it was auctioned by Antiquorum in September of 2005 in New York for only $59,800. Today it is worth at least $150,000. The beauty of this watch model lays in its absolute simplicity. Panerai watches that only have an hour and second hand are typically referred to as a Base Panerai model–as in, Basic. 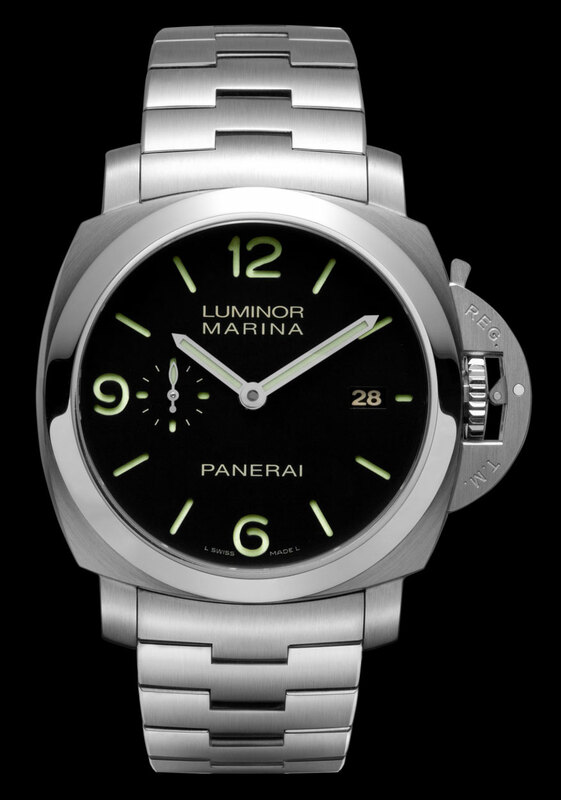 "Luminor” Officine Panerai, “Luminor”, Ref. 6152-1. Made in the late 1950s for the Italian Navy. Fine and very rare, large, cushion-shaped, water-resistant, stainless steel military diver’s wristwatch with Panerai buckle. Signed Rolex, three-body, polished and brushed, screwed-down case back, straight lugs, winding-crown with security lever, anti-magnetic dust-cap. D. Two plate; black upper plate with pierced Arabic numerals and indexes over a luminous-coated lower plate. Radium-coated "bâton" hands. M. Cal. 15 3/4''', signed Rolex, rhodiumplated, "fausses côtes" decoration, 15 jewels, straight line lever escapement, monometallic balance, self-compensating Breguet balance-spring. Dial signed Panerai; case and movement signed Rolex. Dim. 47 x 47 mm. Thickness 18 mm. Anselmo Grimoldi : Has worked in the field of horology for over 50 years with an enormous amount of passion, curiosity and dedication. 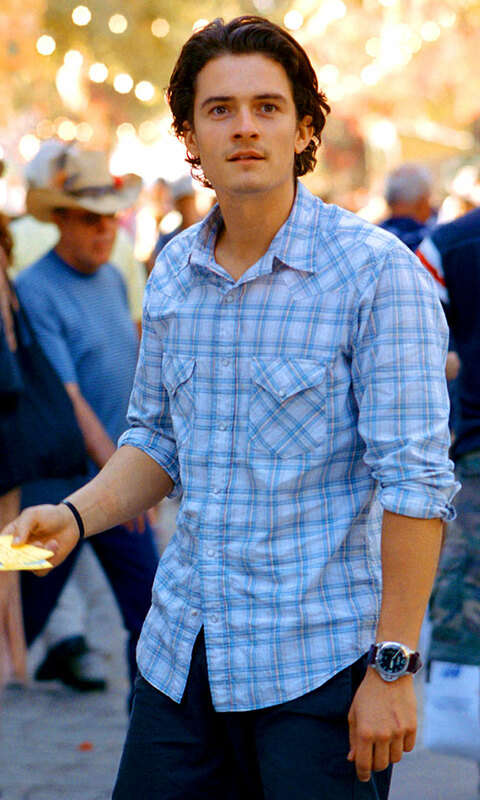 He has recently launched his own brand of watches and jewellery bearing the name “Grimoldi”. In the early 1980s he was introduced to a former military man Dr. Rossi who told him the story of the unique instrument maker that is The Officine Panerai. This story fascinated him and led to his spending the next 25 years searching for the elusive original models made for the naval commandos of the Italian navy as well as the commandos of other Mediterranean Navies. This impressive collection comprises examples of all of the various types made utilizing both Rolex and Angelus movements including the “Egyptian Commando” and the only example of a vintage left handed Panerai. Anselmo Grimoldi's belief in this brand lead to him approching 3 admirals when they took control of The Officine Panerai to negotiate the sole distrubution rights for Milan which they granted him. Later when the company was bought by the Richemont group he and his close friend Angelo Bonati who took over the day to day operations of the company, and often askes Grimaldi his oppinion as a world renowned expert on the brand. 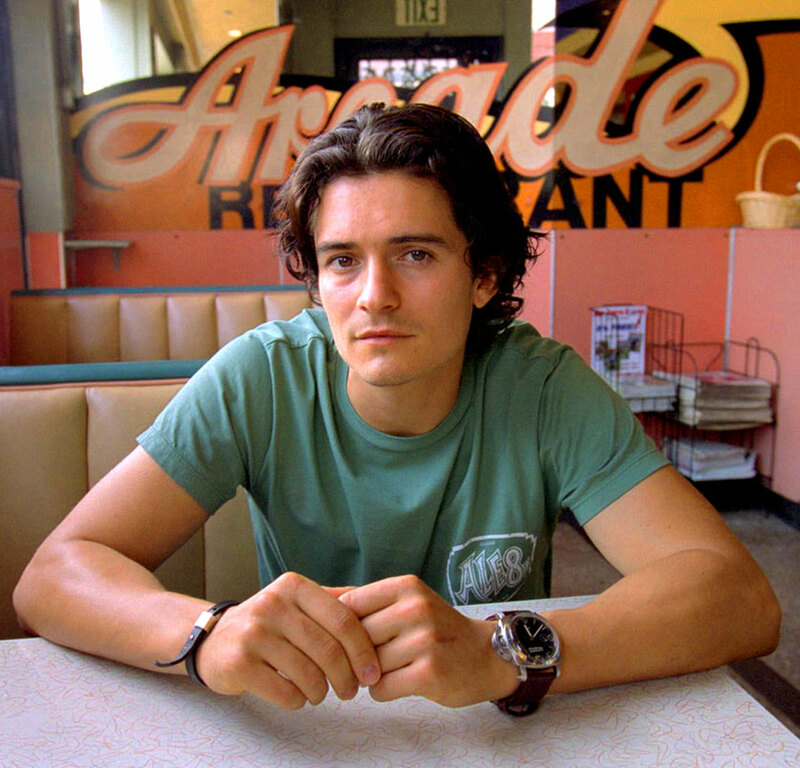 Orlando Bloom starred in Elizabethtown in 2005, which was one of his first movies where be played the lead character, and as you see below, he is sporting a Luminor Panerai [Reference PAM127]. 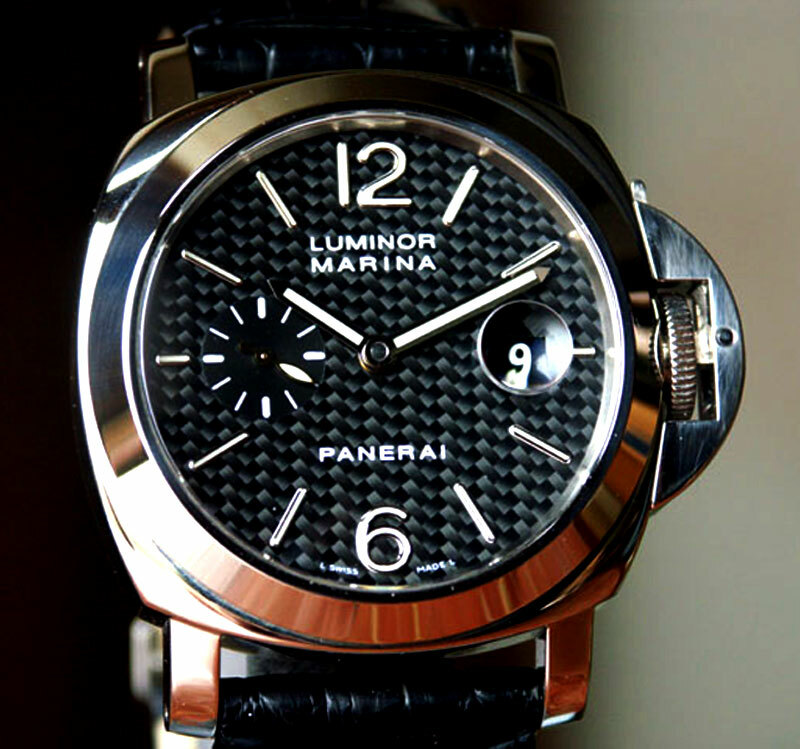 The photo below shows the Panerai Luminor Marina PAM180 in detail. In this photo you can clearly see the black Carbon Fiber dial. The model as produced as a limited edition of only 150 pieces and is out of production. The watch has a 42 hour power reserve C.O.S.C. movement., with a 3.5mm thick synthetic sapphire crystal with an anti-reflective coating. 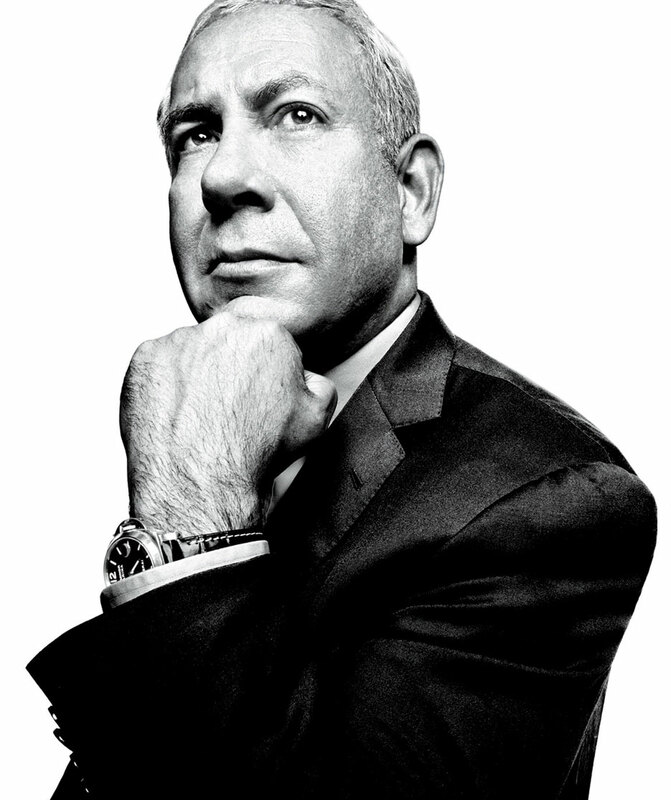 Benjamin "Bibi" Netanyahu is the current Prime Minister of Israel, as well as the Health Minister and the Economic Strategy Minister. 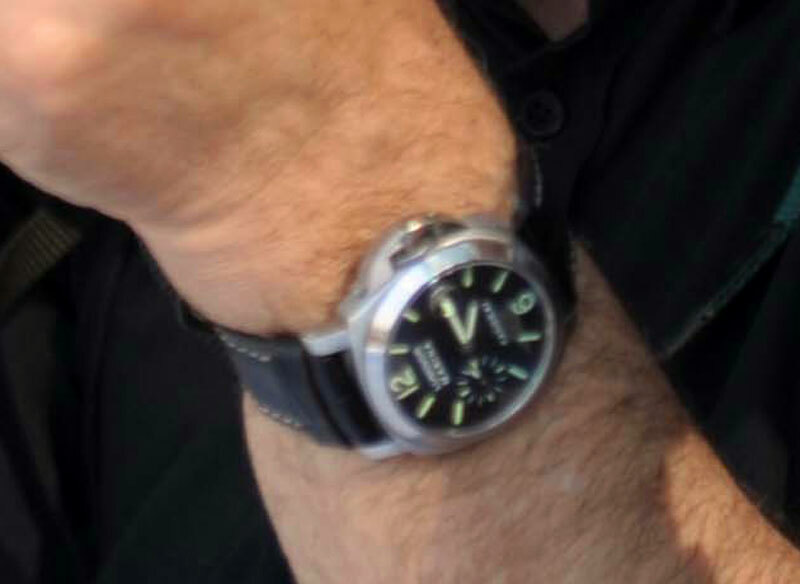 He wears a Panerai Luminor PAM 048 as seen below. 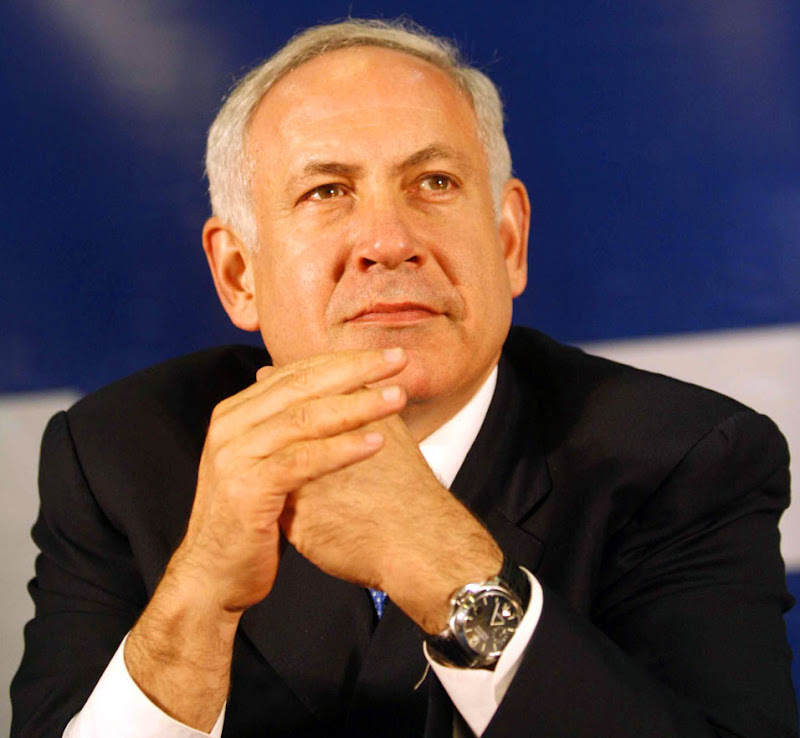 Benjamin Netanyahu is the first Israeli prime minister born in Israeli Prime Minister born in Israel after the founding of the state. Between 1956 and 1967 he lived in Cheltenham, Pennsylvania in the U.S.A., and to this day he speaks with an American English, Philadelphian accent. 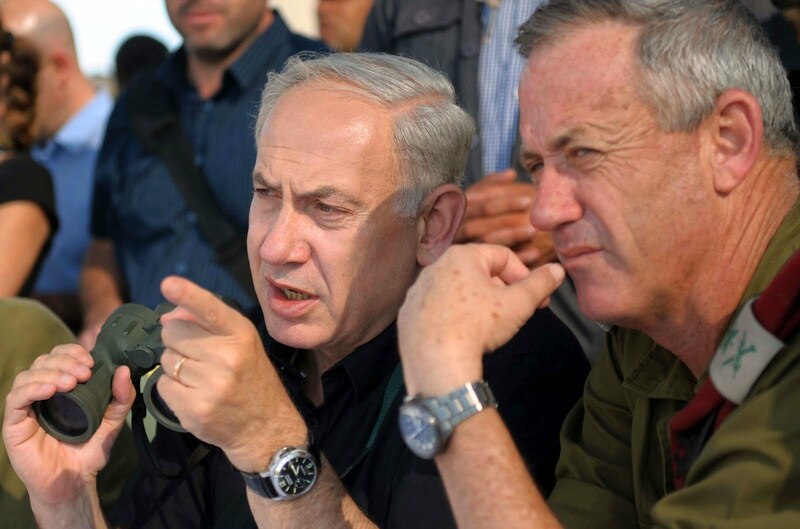 Israeli Prime Minister, Benjamin Netanyahu is pictured below with Israeli Defense Forces Chief of Staff, Lt General Benny Gantz, as they observe an army infantry exercise taking place in the Golan Heights. 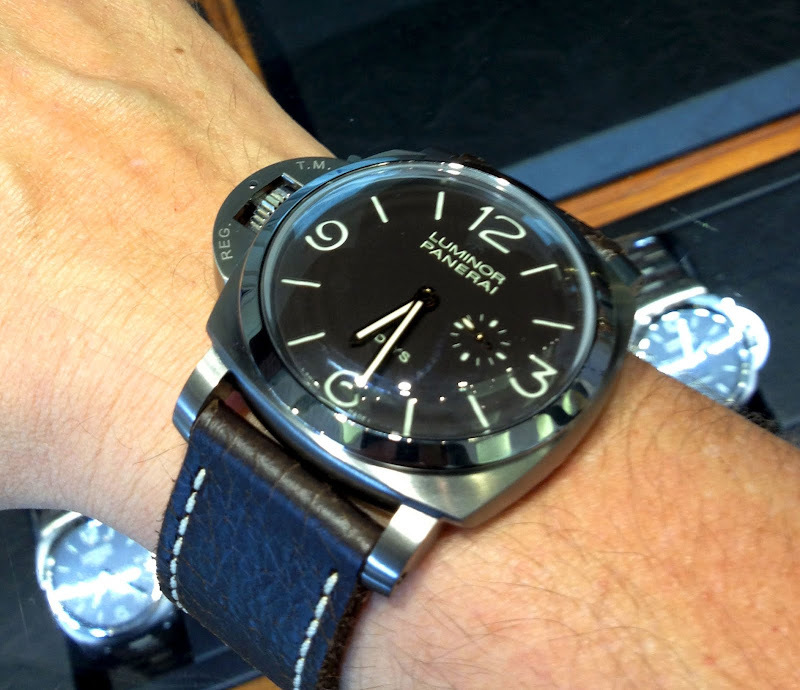 Recently I was in Shreeve & Company in downtown San Francisco, and I was checking out some different Panerai watch models. I happened to check out the PAM 368 which is a Special Edition Panerai, limited to only 1000 individually numbered pieces, which were made in 2011. The PAM 368 is 47MM and it has a brown dial. 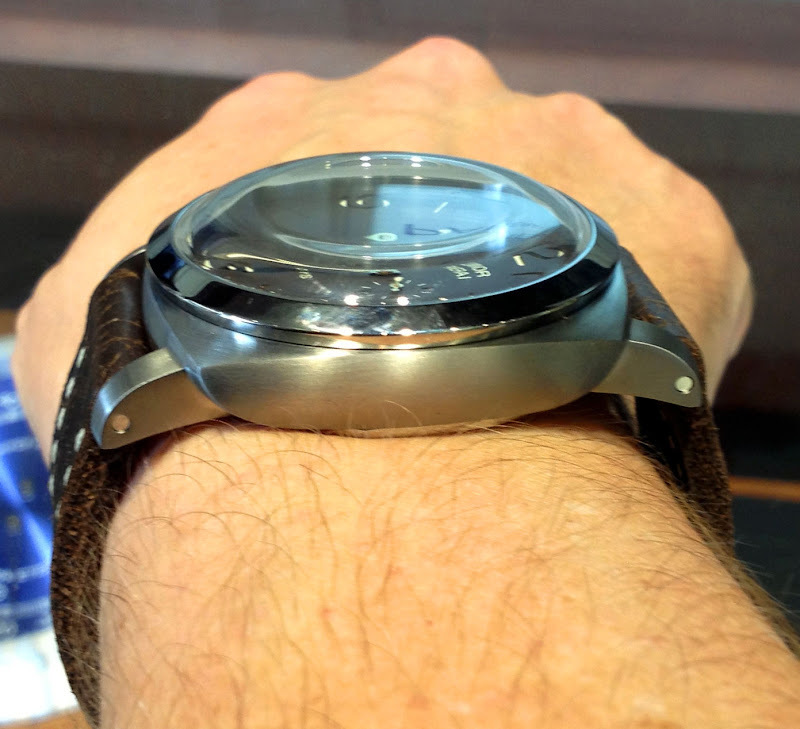 The PAM 368 uses the 1950 case and it's made out of titanium. The entire case and crown guard are brushed with a satin finish. The domed crystal is made out of synthetic sapphire crystal, and it has a manual wind movement with the 8 day power reserve. Some people prefer the 8 day movement because if they forget to wind it after a few days, it will keep going. The PAM 368 has the classic art-deco style Panerai 1950 case, which has superb curves. The lug opening is 26mm, and the crystal is 2mm thick. The PAM 368 comes with a Panerai antique brown (tobacco/dark chocolate) calfskin leather strap, paired with a Panerai Pre-Vendome titanium tang buckle. 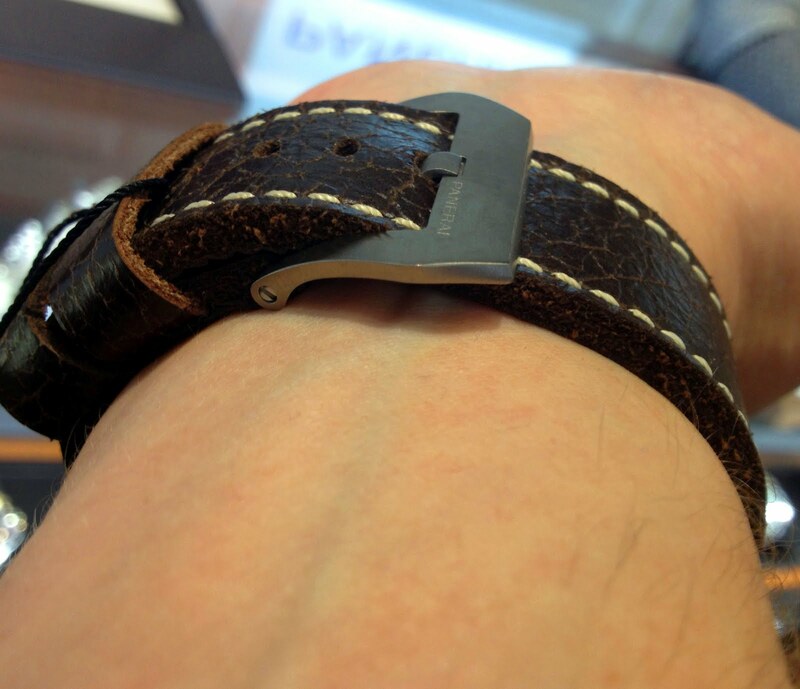 I really like the curved Pre-V bottle opener style buckle, which gives it a really cool, clean, streamlined, modern look. I like this style way better than the flat, non-curved vintage buckles. 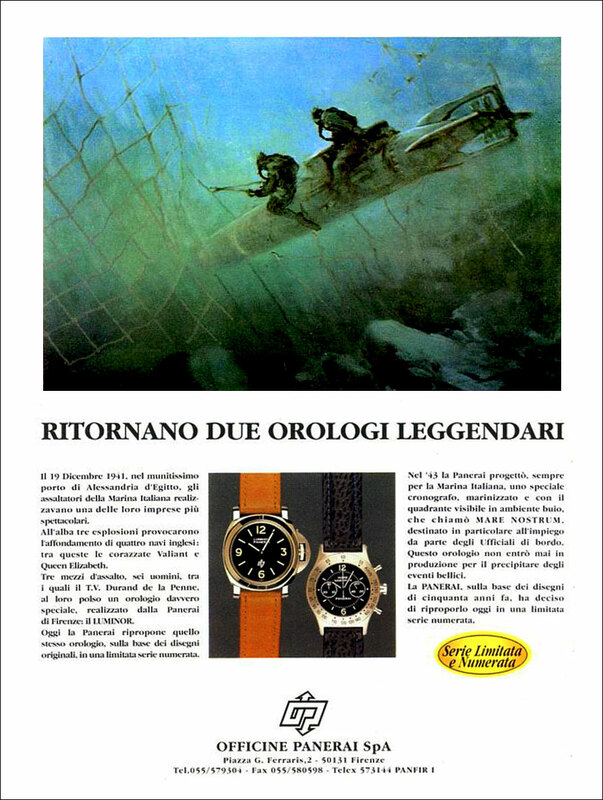 When Panerai was reborn in 1993, they came out with this magazine add that showcased the 44mm Luminor Paneria [Reference 5218-201A] which featured the new Officine Panerai logo and was commonly referred to as Luminor Logo Watch. They also showcased the 42mm Mare Nostrum Chronograph [Reference 5218-301/A], next to a base Luminor Panerai with. 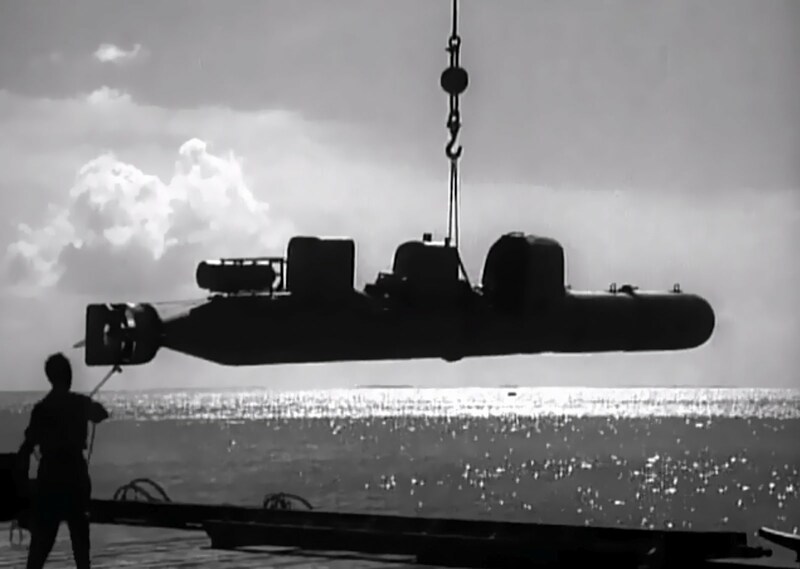 In October of 1945, The United States Chief Of Naval Operations presented this video documentary produced by the O.S.S. (Office of Strategic Services) and the Bureau of Aeronautics, named German and Italian Sneak Craft. 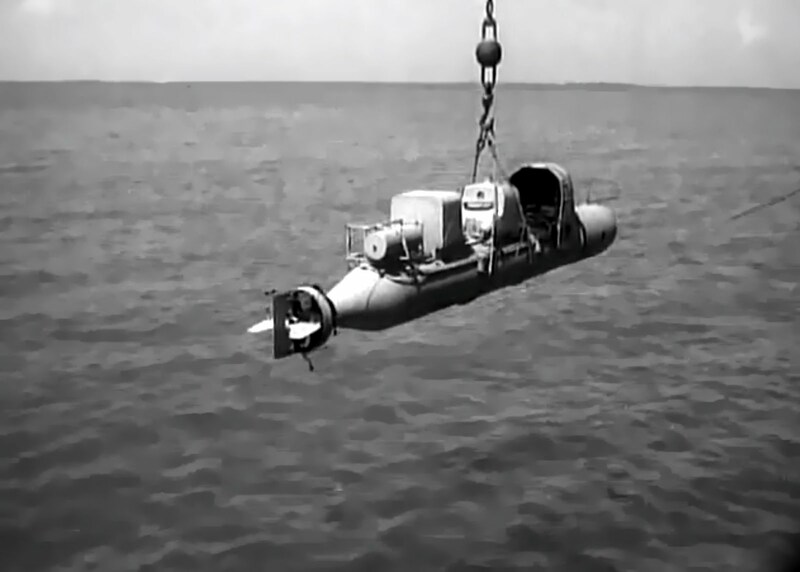 The first video is showcases the Italian Human Torpedo. The second and third video show the fascinating documentary. The next 7 images are screen shots I took from the U.S. Navy documentary seen above. The first two images show the Italian Human Torpedo, which was also commonly referred to as a Pig, Hog, Chariot, Slow Speed Torpedo, and Maiali. 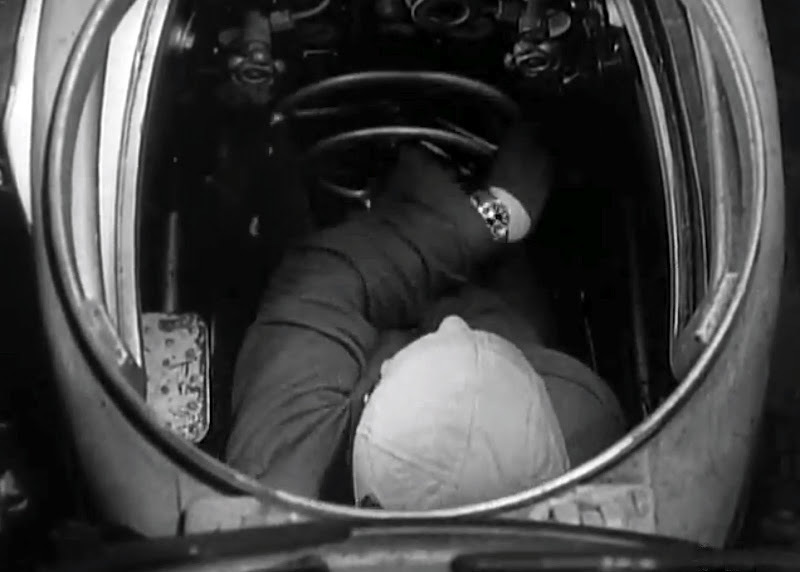 The next 5 photos show a German Kampfschwimmer's wearing Panerai watches during World War II. 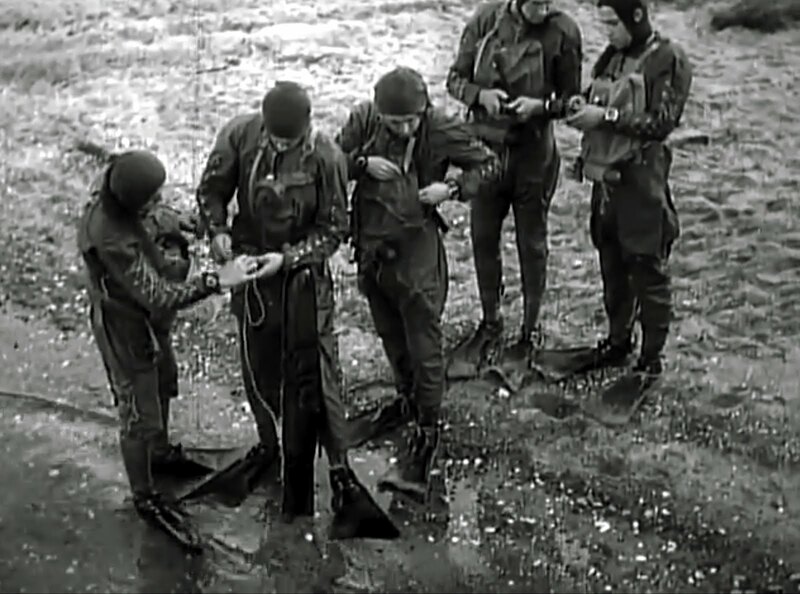 You can tell they are German because their diving suits have shoelace like eyelet holes running down their arms. This next O.S.S. 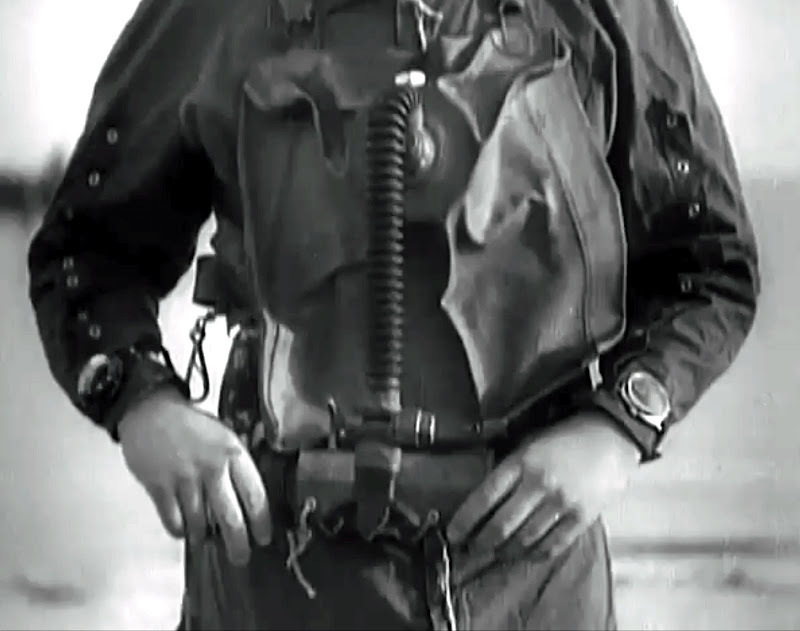 image is of the same German Kampfschwimmer pictured above, and it shows him with his frontal oxygen tank, and breathing cable dangling in front of him. 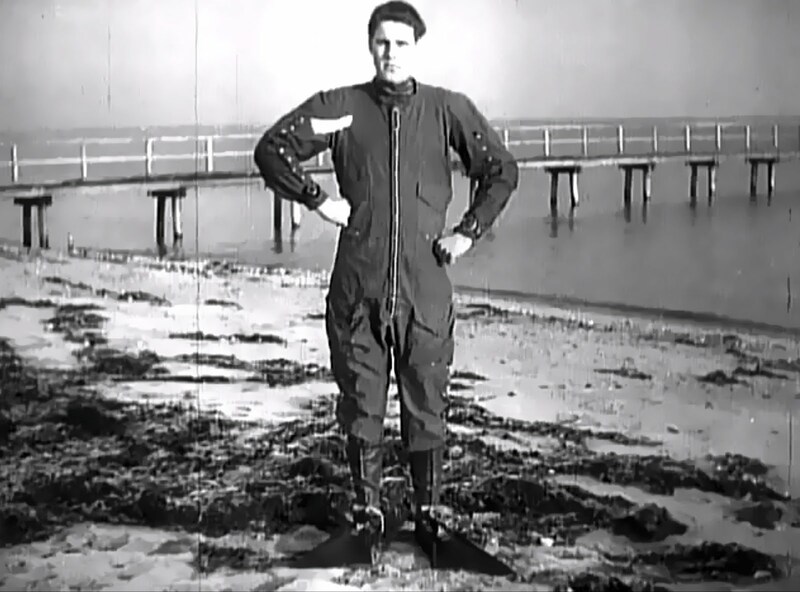 You can see he is not only wearing a Panerai watch over his diving suit, on his left wrist, but he is also wearing a Panerai Underwater compass, or metric depth guage on his right wrist. In the photo below we see five German Kampfschwimmer's preparing to dive, and notice they are all wearing Panerai wrist watches. 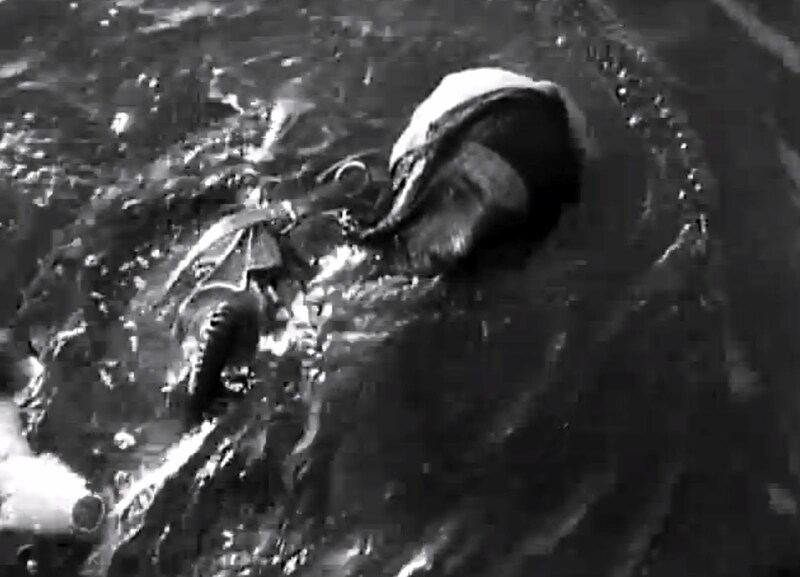 In this next image, we see a German Kampfschwimmer in the water and he is wearing a Panerai on his left wrist. This last image is interesting because it shows a German Kampfschwimmer wearing a Panerai while piloting a mini submarine during World War II. 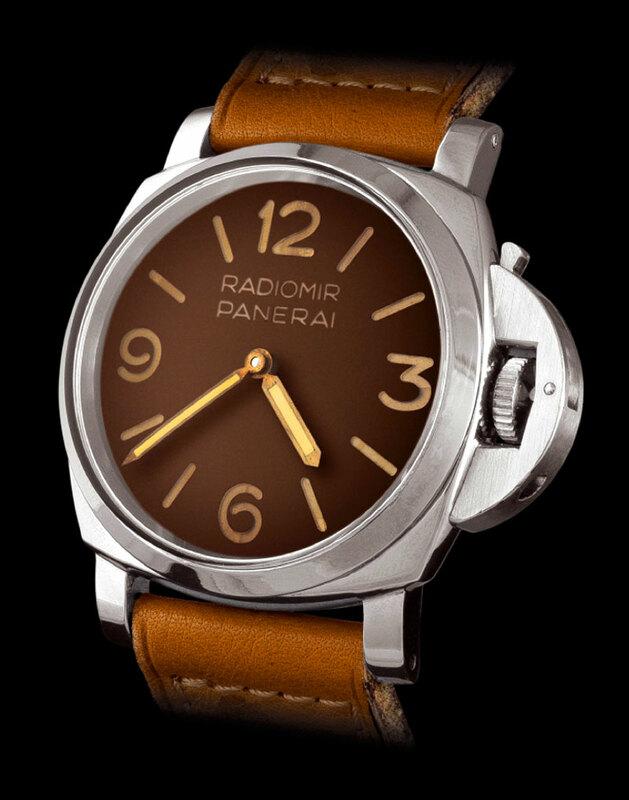 I have been absolutely fascinated with the evolution of Panerai design language , and the modern Radiomir PAM00210 is one of my favorite models. 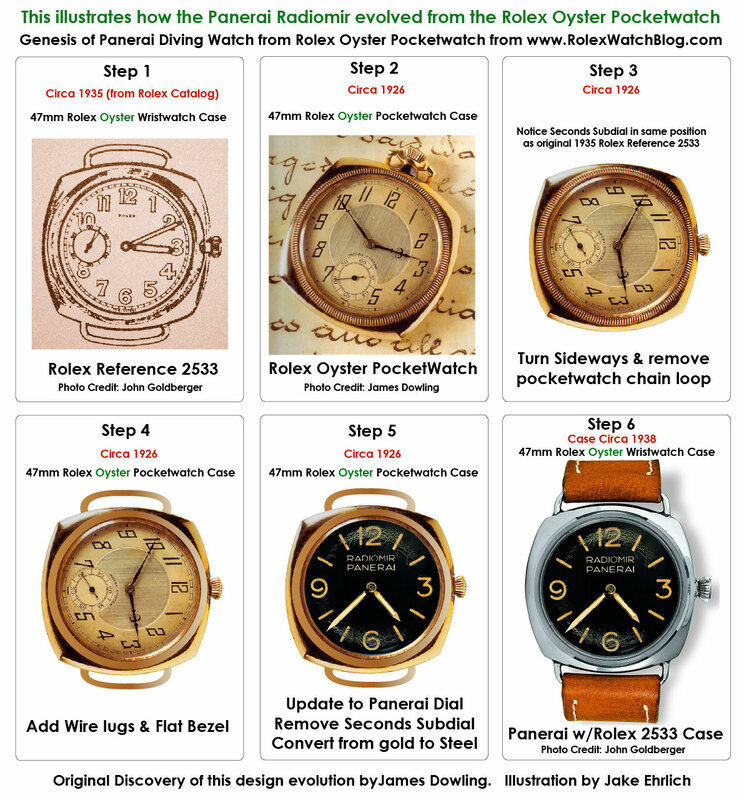 I created the illustration below years ago to show how the original Panerai cushion case evolved from a Rolex Oyster pocket watch. You can learn much more about the history and evolution of Panerai design language by reading The Complete History Of Panerai. By the way, notice how similar the modern PAM00210 (pictured above) looks compared to its Rolex Reference 2533 Case Radiomir pictured below which was made in 1938!!! It is also fascinating to note that Rolex did not develop the now trademark, half crescent winding crown guard mechanism for Panerai until 1946, when they introduced the 6152/1. Pierre Sims from France took this photo and I really like it because it very accurately shows how the modern Panerai brand evolved the vintage cushion case and modernized it by squaring it off. In other words, the watch on the right is a modern Panerai which has a classic vintage cushion case shape, like the Panerai cases from the 1950s. The case located on the left is a modern Panerai case, and it has a more macho vibe to it. Years ago, I wrote The Complete History Of Panerai, as the third chapter in my series named, The Complete History Of The Rolex Submariner & SEA-DWELLER: Rolex’s Conquest Of The Ocean, which was published on Jake’s Rolex World. 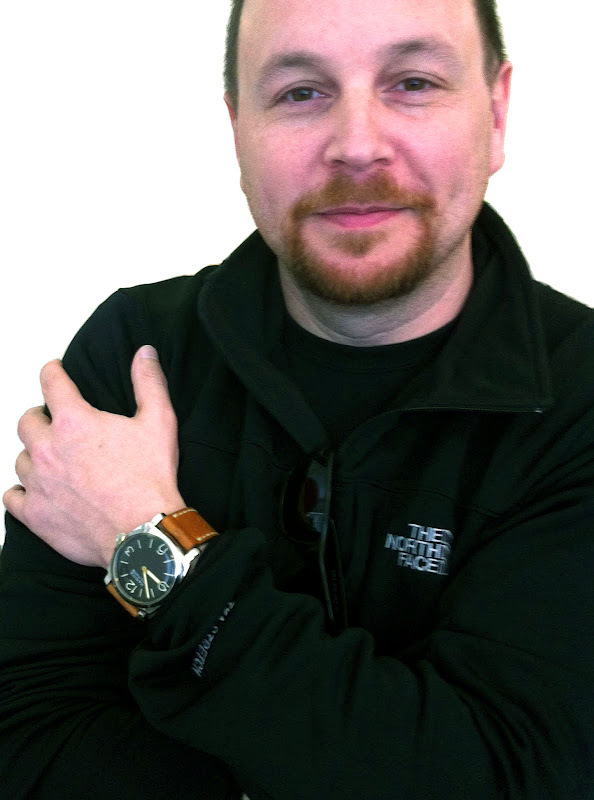 My name is Jake Ehrlich, and I am the editor and publisher of Jake's Panerai World, as well as Jake's Rolex World and Jake's Patek Philippe World. You can explore and visit all of my blogs by scrolling to the bottom of this page. I really like Panerai watches, and in particular, I love the original Panerai vintage watches which were made by Rolex. Rolex actually made all vintage Panerai watches, from 1936 through 1956. 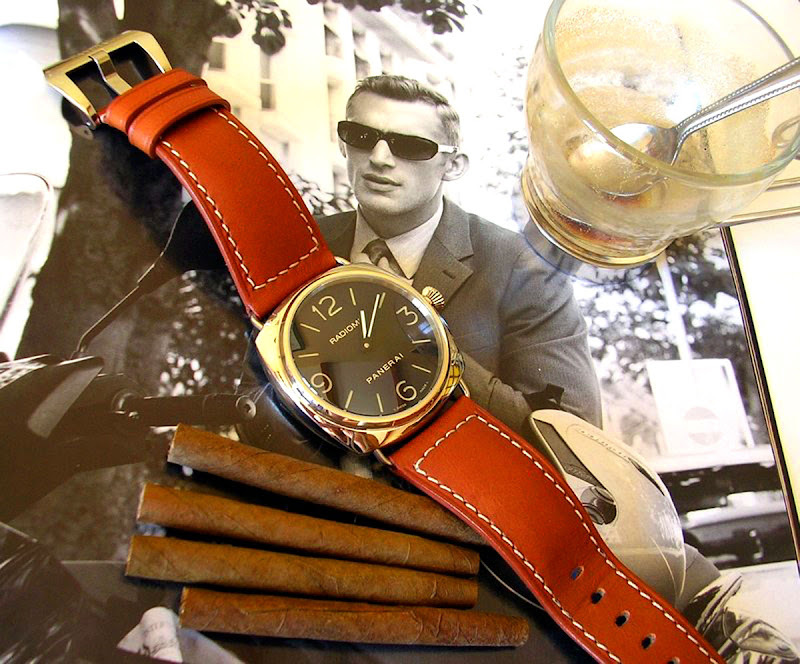 The original vintage Panerai watches made by Rolex were the very first Tool Watches, and Diving Watches ever made. In other words, 18 years before the advent of the Rolex Submariner diving watch in 1953, the very first Rolex diving watch ever made, was a Panerai. I am particularly fascinated with exploring the design nexus between the iconic Rolex Submariner and the original Rolex made Panerai models. It is very subtle, but if dig deep enough you discover a great deal of similarity, hidden in design language. 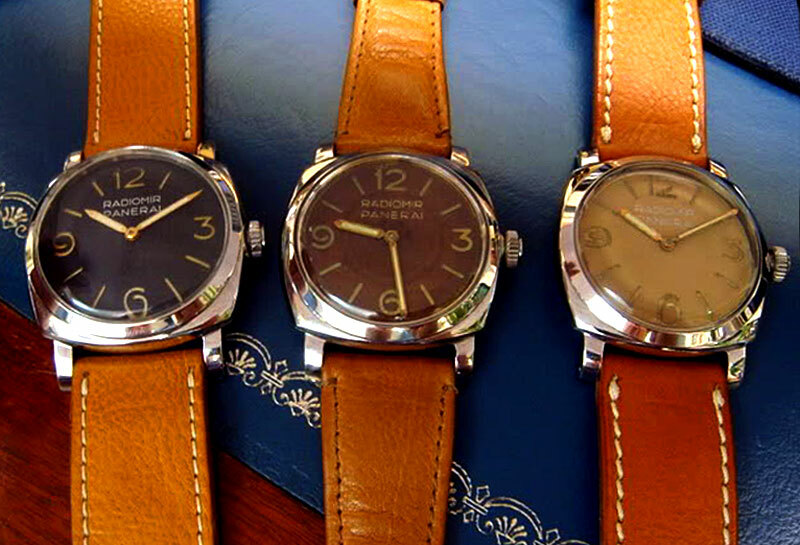 The original Panerai watches are all worth a fortune today since they are so rare. 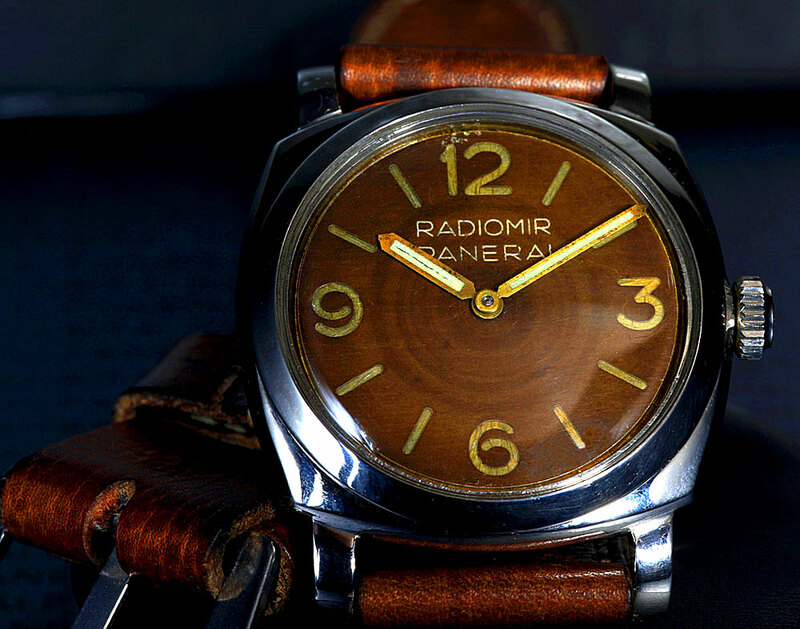 There are likely less than 1000 vintage Panerai watches in existence. They were originally made exclusively by Rolex for the Italian Royal Navy, and were never available for purchase by the public. As a designer, I really appreciate the timeless Art Deco design and simplicity of the original Panerai watches. All the original Panerai watches made by Rolex from the 1930s through the 1950s were 47mm, and at the time they were considered to be enormous. Since then, humans beings have grown considerably in scale, and it is profoundly ironic to consider that our generation and the next are becoming comfortable with the larger size watches. This makes wearing an original 47mm Panerai today, a super cool looking experience. In other words, Panerai watches have transcended time more than any other brand, in a back-to-the future kind of way. 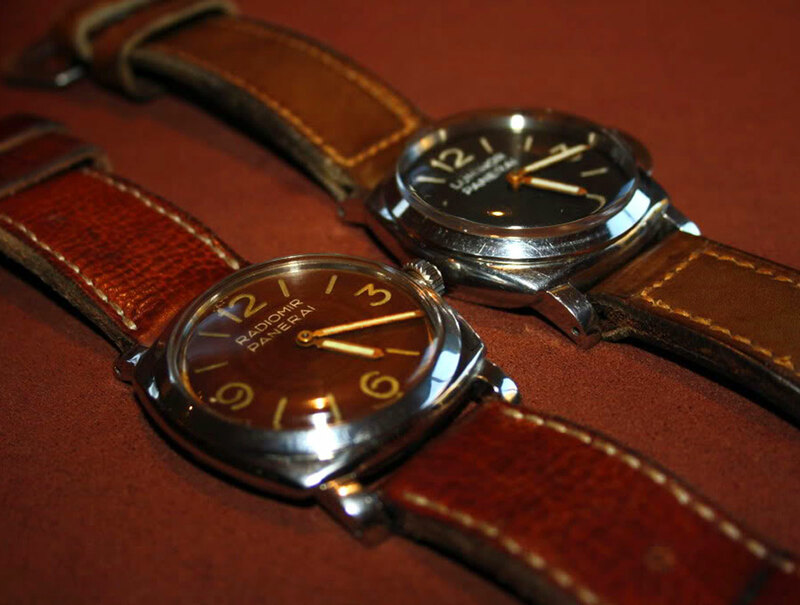 Panerai watches remained dormant from the mid 1950s until they were resurrected in Italy in 1993. In 1996-1997 the Panerai watch brand was purchased by the Vendôme Group, thus making all watches made between 1993 and 1996-1997 "Pre-Vendôme." The "Pre-Vendôme" watches ranged in size between 42mm and 44mm and primarily featured the classic trademark design "Luminor" case which is distinguished by the half-crescent shaped crown guard. These "Pre-Vendôme" watches were scaled-down versions of the original Rolex made Panerai watches, and paid homage to the earlier Panerai models. Academy Award winning actor, Sylvester Stallone had typically worn sport Rolex watches, and while shooting a movie named Daylight in Italy in 1995, happened to walk into the Panerai boutique in Florence and discovered the recently resurrected Panerai watch brand. 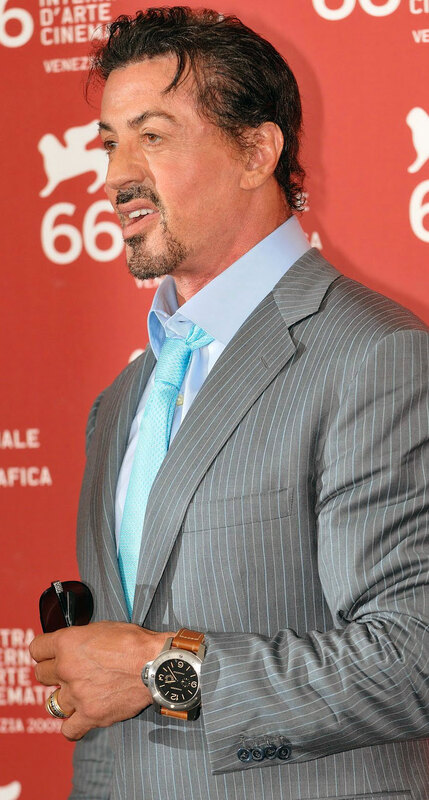 He instantly fell in love with the brand and developed a relationship whereby Panerai made special edition Panerai watches for Stallone to give to his friends, like Arnold Schwarzenegger, and these limited edition watches carried the "Slytech" moniker designation. Stallone also wore Panerai watches in the Daylight movie. 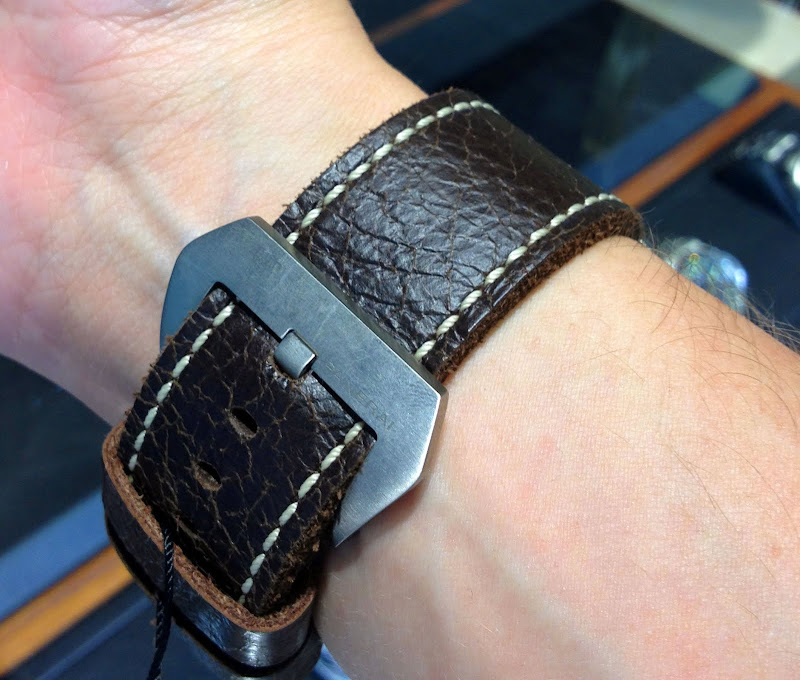 All the "Pre-Vendôme" Panerai watches were considered to be very masculine and macho, and they all came with the similar designed "bottle opener" buckle which most of the original Rolex made Panerai watches came with. After the Vendôme group took over in 1997, they started making all kinds of fascinating new variants based upon the original Rolex cushion case design language, and added all kinds of options like chronographs. 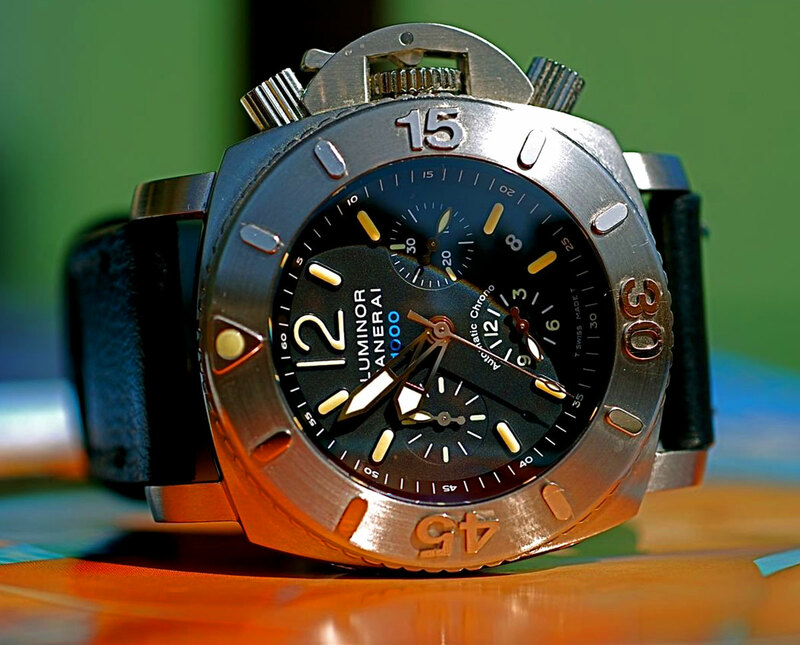 Today Panerai is owned by the Richmont Group which owns and controls The Vendôme Luxury Group. The Richmont Group, known formally as Compagnie Financière Richemont S.A., is a Swiss luxury goods holding company which was founded in 1986-1988 by Johann Rupert, who is a South African businessman. The Richmont Group owns many luxury goods brands including, A. Lange & Söhne, Baume & Mercier, Cartier, Jaeger-LeCoultre, James Purdey and Sons, Montblanc, Vacheron Constantin, and Van Cleef & Arpels. The Richmont Group also makes Ralph Lauren watches as part of a joint venture with the Polo Ralph Lauren Company. 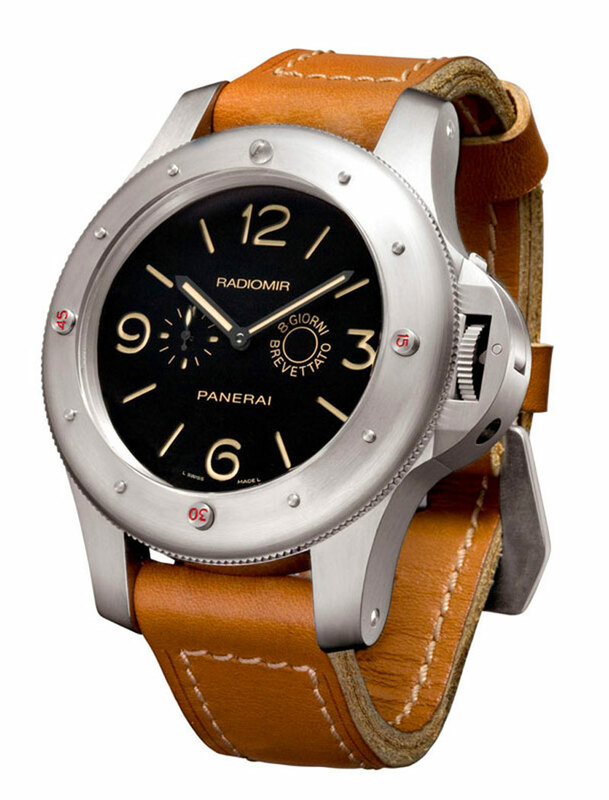 Since The Richmont Group acquired Panerai, Panerai watches have grown tremendously in popularity. 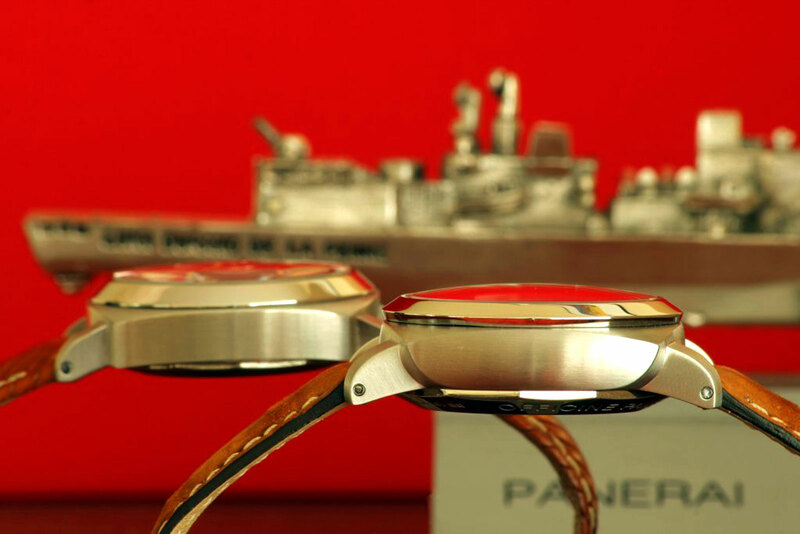 Since then, Panerai has experimented like crazy, and even made special Ferrari models. The reason I created Jake's Panerai World is to share all the knowledge and insight I have gained over my years as the world's leading Rolex historian. As a designer, I am absolutely fascinated with the original design language of Panerai watches, and invite you to explore the entire fascinating history of Panerai with me.